Hypothetical data below - let's say that my HTML table looks like below, how could I use C# to only return the first two columns of data for each row in the table? The question is too vague to answer. You're showing HTML which is client code but asking about C# which runs on a web server. If this is a query question then can you tell us what data access you are using? Are you using Entity Framework or ADO.NET? Where does the data come from? If you are asking how to render dynamic HTML from the server then we need to know what kind of application you are building; Web Forms, MVC, Razor Pages? This is how data is displaying on a web page when I view the page source. I am wanting to use C# to "query" the page and return only the first two columns rom the table. You have not answered any of the clarifying questions so I'm not sure how to provide assistance. Is there anyway you can show the current C# code? Precisely, what is it that you cannot do? Do you know how to get the text of the page into a c# string? Do you know how to find elements within the html string? Is the sample the result of a GET or a POST? Do you know how to make the request? 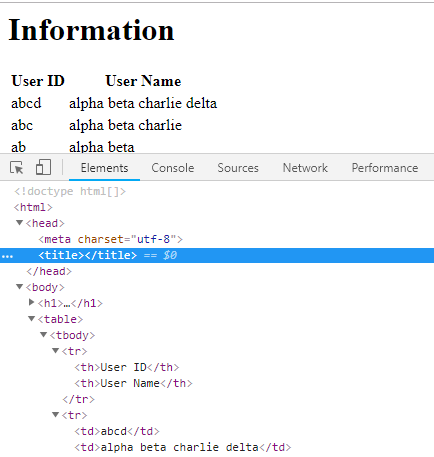 Will the real html have the sorts of syntax errors that your sample shows? Be prepared for a lot of difficulty if that is the case. What data structure do you want the answer in? Show whatever code you have so far and tell us what result you want. I generally use linq-to-xml (Eg Beth Massi article ) but, I believe, the agility pack is far superior at handling mal-formed html like your sample. If you want to only show the first columns of the table using c#, you could use xml api.